Over the years, I have managed to engage in at least three combat sports and pillow fight professionally with relatively little incident. The activity that finally did me in was crafting. Or, to be more precise, coming home from craft night after declaring that my craft for the evening would be drinking wine. 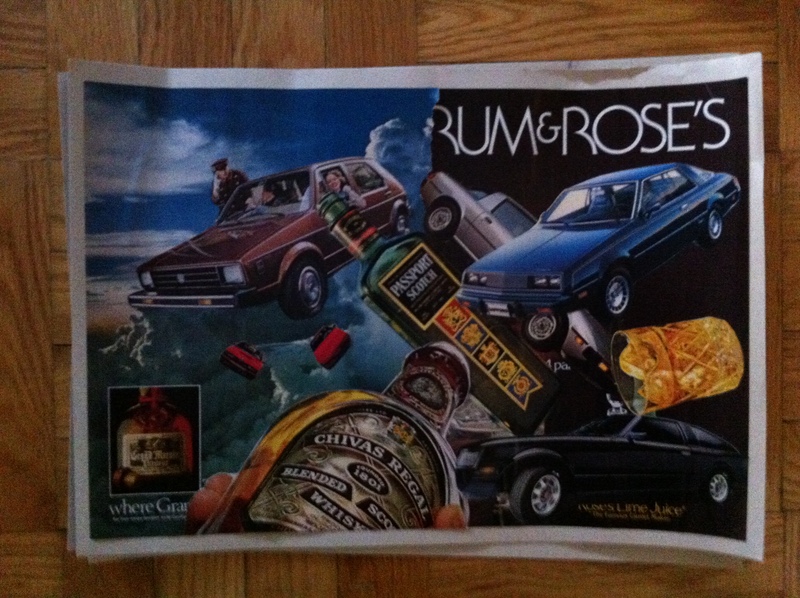 I did end up making this collage about drinking and driving, though. The gist of this piece is that if you drink and drive, you go to heaven. Which is filled with tiny Mustangs floating in the clouds. It was a lovely craft night. I drank questionable wine with far less questionable people. 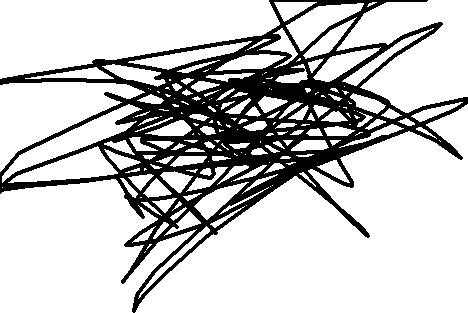 I made wonderful art. 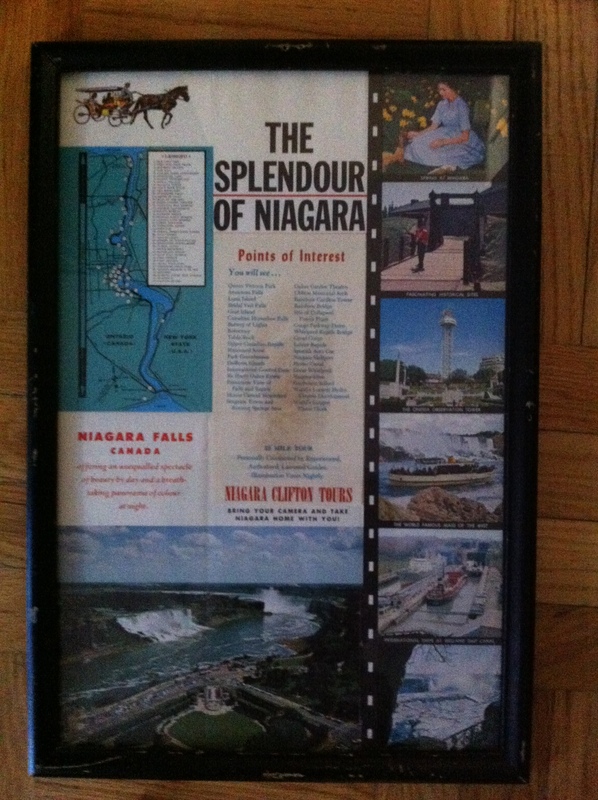 A friend of mine gave me an absolutely brilliant old Niagara Falls tourism poster that she found at Goodwill. And so I went home just after midnight, tipsy and in love with the world because I had amazing friends who see cheesy Falls memorabilia and buy it for me because they know how much I love it and friends who agree to join me at craft night so that I can lend them Oz DVDs and friends who let me cut up their old issues of OMNI and make collages out of their car ads. The Niagara Falls Poster, my trusty companion on this fateful journey. The closer I got to home, though, the more my unbridled love for the universe was replaced by an unbearable longing for pizza. And when I finally got off at Eglinton Station, I went off in search of the exit that would take me closest to the Pizzaolo. This seemed like a perfectly logical course of action at the time. Going out one of my more common exits and then heading south for half a block seemed so utterly unnecessary. I went out what I thought was the right door. It was, as it turns out, not the right door at all. 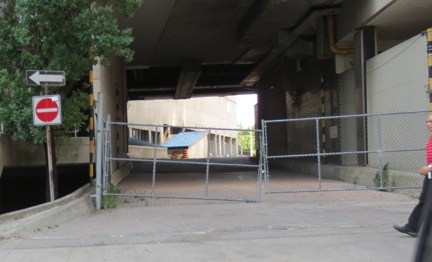 It was, in fact, a door that probably shouldn’t have been unlocked at all, seeing as how it led to a chunk of the abandoned post-industrial wasteland that used to be Eglinton’s bus terminal. I walked toward what looked like an exit at one end of my post-apocalyptic prison, but it was fenced off. I tried the other end, but it, too, was fenced off. So I doubled back towards the demon door that had started the whole mess, and that was when I discovered that it had no handles. I was alone and trapped in an semi-abandoned TTC back alley. Evaluating my surroundings, I quickly constructed a foolproof plan. I called Aaron, told him that I was trapped just south of Eglinton, that I was probably going to have to jump a fence, and that he should come meet me and help me extract my gym bag full of art and my framed Niagara Falls poster from the premises. With Aaron on his way, I hung up and began to inspect the fence in question. Then, out of nowhere, some dude in his twenties showed up and told me some cockamamie story about his duty to guard the fence and make sure everything was OK with it. “I have to take a picture of this fence to prove that it’s fine,” he told me. “Take your picture,” I said. “Is everything fine with the fence?” he asked. “The fence is fine. I just have to climb over it because I’m locked in here. Just take your stupid picture and leave me alone,” I replied. He said OK, and then left without ever having produced a camera of any sort. Weirded out, I decided that I couldn’t possibly wait for Aaron any longer. I would jump the fence and meet him on the other side, triumphant. I had visions of Sherlock elegantly scaling the gate in The Reichenbach Fall dancing through my head. What was supposed to happen: 1. I am trapped. 2. I successfully scale the fence. 3. I execute a perfectly graceful landing and await Aaron with the pride of a grade A fence jumper. What actually happened: 1. I was trapped. 2. I scaled the fence with some success. 3. I leapt like a tool and landed entirely on my right ankle. 4. I flopped around like I was dying. The actual scaling of the fence went off without a hitch, but getting down is always the hard part. Instead of descending slowly, I caught my cardigan on the top of the fence, and then I flung myself off of the damned thing, landing entirely on my right ankle. 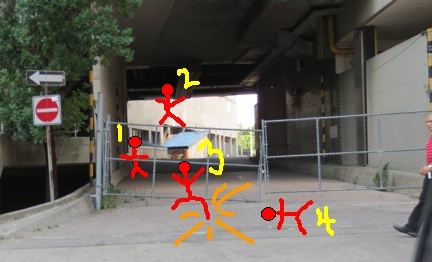 What I realized I should have done, as I was flopping around on the floor: Crawl through the giant, Sarah-sized gap between the fence and the pavement. My right ankle was not impressed. It responded to the latest development in my misadventure by throbbing in immediate and overwhelming pain. I responded by curling up into the fetal position and rolling around on Yonge Street in tears. I called Aaron and told him that I had probably broken my ankle. Then I went back to rolling around. We quickly decided that I needed a cab home. But procuring one isn’t particularly easy when you’re rolling around on a sidewalk. Figure One: How Aaron wanted me to wait for the cab. Figure Two: How I wanted to wait for the cab. But every time I tried to stand up, everything turned blue and my already strong desire to vomit increased exponentially. So I went back to rolling around on the sidewalk. Eventually, we managed to hail a cab and I hobbled home. I called my mother, because that’s how grown-ups deal with things. She agreed to drive up and take me to the emergency at Sunnybrook. By the time she arrived in town, I’d moved past hysterical sobs and reached some sort of delirious brand of bemused giddiness. She assured me that it was fine, and tried to placate me with some story about the time she stepped on a twig when I was three, but somehow that didn’t really work. I moved on to other concerns. Two pleasant and only mildly long visits to Sunnybrook later, we’ve confirmed that nothing’s broken. The swelling, in all of its gargantuan proportions, should go down within the next four or five days. The psychological scars, however, will be around for much longer. What bothers me most about the whole fiasco, somehow, is the discovery that I’m absolute rubbish at scaling fences. 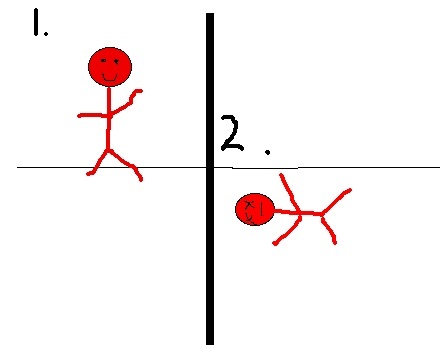 After years of ever so slightly crazy physical pursuits and physical training, I flopped off a fence like a drunk toddler attempting the world’s worst parkour demonstration. Far from my visions of flinging myself over the fence with the catlike grace of Sherlock Holmes, I now find myself at the opposite end of the Cumberbatchian physical acting spectrum, lumbering around like The Creature finding his footing at the beginning of Frankenstein. And Pizzaolo wasn’t even open when I had my great fall. 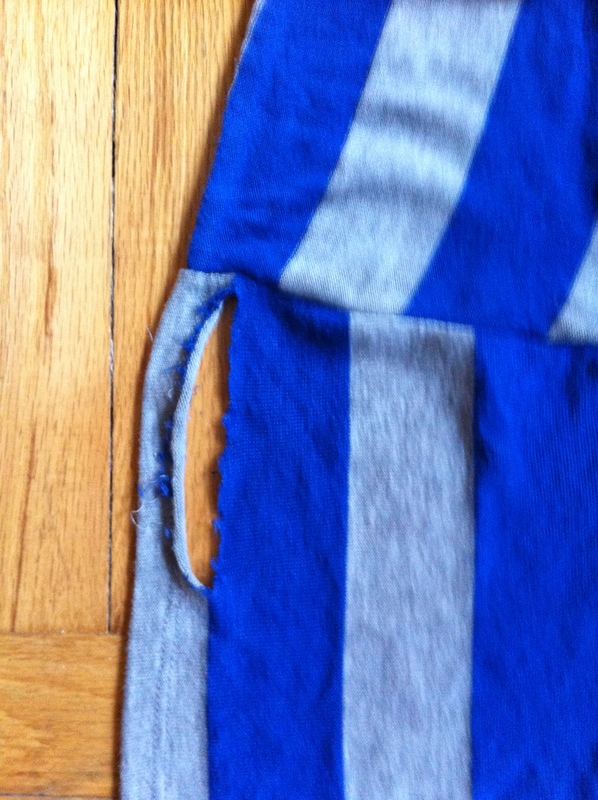 Not that I could have stomached it in the aftermath, anyway. Sarah, that’s a well-written but sad story. I hope you are back in great shape soon, especially your soul. Sarah, I hope you aren’t in too much pain following your battle with the fence. This came to mind as I was reading. 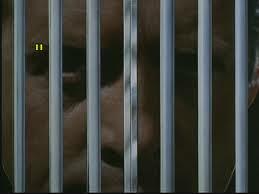 Rember Sarah – what does not kill you – will make you stronger — there are many more fences out there to conquer. Hope your feeling better. I’m at the cottage this week, but I’m (in theory) free after that.